Fran Kovac is a student and teacher of bookbinding and uses all the curiosity of both in her private practice in Cleveland, Ohio. 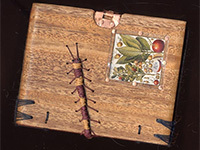 A student of the history of bookbinding, Fran has recreated historic bindings and uses many historic techniques and sewings in making contemporary decorated bindings. Since 2009 she has taught at the Morgan Conservatory, Hollander's in Ann Arbor, Michigan and for San Diego Book Arts. Her bookbinding studies have included classes with book historians Julia Miller, Pam Spitzmueller and Jim Croft, among others. Aimee Lee is an artist, papermaker, writer, and the leading hanji researcher and practitioner in North America. (BA, Oberlin College; MFA, Columbia College Chicago). Her Fulbright research on Korean paper led to her award-winning book, Hanji Unfurled (The Legacy Press) and the first-ever American hanji studio, located in Cleveland, Ohio. She teaches, lectures, exhibits, and is collected internationally. 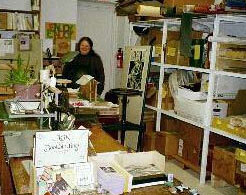 Laura Martin is a retired academic who is one of the founders of Octavofest and an early member of Art Books Cleveland. 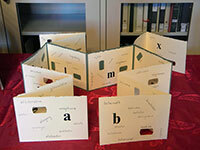 She exhibits and teaches as a book artist and papercutter. She has been a docent at the Cleveland Museum of Art since 2007. She also serves CMA as Healthcare Education Consultant, working with the Vital Signs program, an initiative that uses the museum’s art collections as laboratories for enhancing the observation, communication, and teamwork skills of health professionals. Bookbinding can itself be something of a mystery, as each book has its reason for falling apart and its own best way to be repaired. Ellen Strong loves a good mystery! Strong's book career started in New York as a bookseller at Barnes and Noble. Back in Cleveland she worked at the legendary Publix Book Mart before opening her own shop, Coventry Books, in 1972. Dealing with both new and used books, Strong became fascinated by the technology of book construction and curious about the techniques of book repair. While still a bookseller, she first studied with retired bookbinder, Walter Flick and later with a master bookbinder Jean Gunner for 5 years at Carnegie Mellon in Pittsburgh. Ellen Strong is a life-long Cleveland Heights resident has been repairing broken and tattered books more than 30 years for individuals, libraries, and institutions. For a dozen years she was a book conservator at Kelvin Smith Library at Case Western Reserve University. She teaches bookbinding at Strong Bindery. Classes include: Beginning Bookbinding, Intermediate Bookbinding, and Advanced Bookbinding; Paper Marbling; Box Making, Leather Binding, Box Making, and various other aspects of binding. In 2005, after a 20 year run at the Murray Hill School, her business, Strong Bindery, moved to Loganberry Books, 13015 Larchmere Blvd. where it presently resides. Do stop in or email her at strongbind@hotmail.com. This year's program is made possible, in part, by the Ohio Humanities, a state affiliate of the National Endowment for the Humanities. Any views, findings, conclusions or recommendations expressed in this website do not necessarily represent those of the National Endowment for the Humanities. Site maintained by the Michael Schwartz Library, Cleveland State University.